This was an extremely difficult task due to the unknown conditions discovered during the renovation process as well as maintaining hotel operations during the entire construction period. The staff at WELBRO worked seamlessly with our architects to coordinate design issues relative to our goals and needs. Jeffrey R. McComas, AIA, Senior Associate Baker Barrios Architects, Inc. 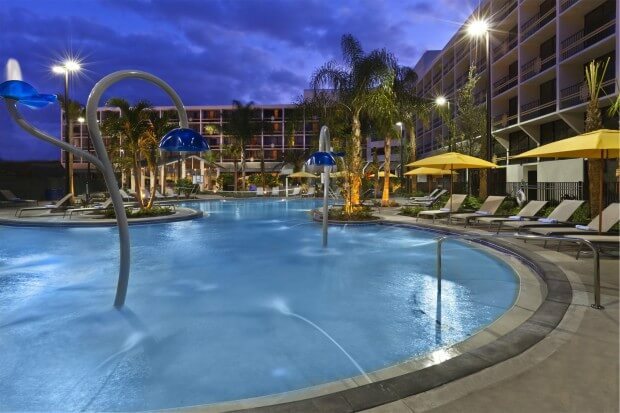 Formerly known as the Sheraton Safari, The Sheraton Lake Buena Vista Resort project consisted of renovating a 27-year old, 490 room hotel into a contemporary resort. Phase One consisted of renovations and improvements to Buildings 2 and 4, half of the courtyard and half of the lobby. Phase Two included Buildings 1 and 3, and the other halves of the courtyard and lobby. Phase Three was the addition of a new 14,000 square foot conference center, new restrooms and renovations to the existing conference hall to create a seamless unified conference center. The existing interior courtyard was mostly demolished and then redesigned to include new drainage, lighting, hardscape, landscape and perimeter railings. A new zero entry pool was added, along with a whirlpool and pool bar. The existing pool and spa was refurbished, and the “world’s largest” python water slide was transformed into a contemporary flume ride.